A kangaroo delayed the second half of a match between soccer teams Blue Devils FC and Canberra FC on Sunday, when it hopped onto the field and set itself in front of goal. After a little while, the kangaroo hopped off the field and toward the carpark. Then it returned, again, to interrupt the second half of play. Gates calls Ctrl+Alt+Del a mistake: Bill Gates said he would have preferred a one-button alternative to the keyboard shortcut Ctrl+Alt+Del. Alpine climber finds ‘crash’ jewels: A French mountain climber finds a box of precious jewels in the Alps in what is thought to be debris from an Air India crash decades ago. Star Wars voted top movie theme: John Williams’ Star Wars theme has been voted as the UK’s favourite film soundtrack by BBC Radio 3 listeners. Spain to consider time zone change: Spanish MPs are to consider putting the country back by an hour, after a report said this would improve eating, sleeping and working habits. Swiss wargame casts France as enemy: The Swiss army has carried out a training exercise which simulated an attack by France, it emerges. Cash-scoffing pooch gets $500 refund: A man in the US state of Colorado, who left his dog alone in his car, found it had eaten 500 dollars in cash. Chimpanzee ‘on the pill’ has twins: A chimpanzee whose birth control failed gives birth to twins at an ape rescue centre in Wareham. MP claims 3p for 100m car trip: Former defence secretary Liam Fox successfully claimed 3p of taxpayers’ money for a car journey of about 100 metres, expenses documents show. Buckingham Palace hosts football: Buckingham Palace is hosting its first official football match, to mark the Football Association’s 150th anniversary. White London taxis sent to Australia: The London cab is being trialled in Australia, but in white rather than the traditional black colour. Living Ohio man ruled ‘legally dead’: A US man declared legally dead after he disappeared 27 years ago cannot now be declared officially alive, though he is in good health, a judge rules. Papal medal misspells name of Jesus: The Vatican withdraws from sale 6,000 copies of a new papal medal which misspells the name of Jesus – but not before collectors snap up a handful. Medellin is ‘most innovative city’: The Colombian city of Medellin is voted as the world’s most innovative for its modern transport system, environmental policies and cultural offerings. Man says ex-girlfriend ‘stole sperm’: US media reports a Louisiana man sues a clinic accusing his ex-girlfriend of stealing his sperm and using it to get pregnant. Dog ‘saves’ missing Polish girl: Firefighters in Poland say a small dog probably saved the life of a three-year-old girl who went missing from her home overnight in freezing temperatures. Miners fired for doing Harlem Shake: Up to 15 miners in Australia have been fired after performing a version of the Harlem Shake underground and posting a video of it online. Hanoi bans short, fat traffic police: Vietnam takes short, obese and abusive traffic police off the streets of Hanoi to improve the force’s tarnished public image, reports say. Sabbath star pens Eurovision entry: Black Sabbath guitarist Tony Iommi writes the song which will represent Armenia in the Eurovision Song Contest. ‘Viking sunstone’ found in shipwreck: A crystal found in a shipwreck could be similar to a sunstone – a navigational aid said to have been used by Viking mariners, scientists believe. Mind the Gap returns after wife plea: A 40-year-old “mind the gap” recording once heard across the Tube will return to one station – so the widow of the actor behind it can hear his voice. Fake fingers ‘used for Brazil fraud’: A Brazilian doctor faces charges of fraud after being caught on camera using silicone fingers to sign in for her absent colleagues, police say. Sick leave shark wrestler is sacked: A charity worker is sacked after his bosses saw footage of him wrestling a shark in Australia while he was on sick leave for stress. MPs locked in after working late: Two MPs are locked in the House of Commons Library on Wednesday, having stayed there working late. Titanic violin genuine, say experts: A violin thought to be the one played by the band leader on the Titanic as it sank is the genuine article, according to experts. Doctor Who script ‘locked away’: Doctor Who boss Steven Moffat admits he is taking special care to protect the secrets of the programme’s 50th anniversary story in November. BBC film ‘disturbed polar bears’: A film-maker who shot a BBC documentary about polar bears could be fined after Norwegian authorities said his methods disturbed the wild animals. Marmite returns to New Zealand shops: ‘Marmageddon’ over as New Zealand shops restock locally-made Marmite, after shortages caused by the Christchurch quake in 2011. Runaway lorry scare on German road: A heavy lorry careers along a German motorway for 10km (six miles) with an unconscious driver at the wheel, but nobody is hurt. Canadian had knife in back for years: Doctors in Canada remove a knife from an unwitting man’s back more than three years after he was stabbed in a fight. Groundhog ‘indicted’ for late spring: Ohio prosecutors issue an “indictment” against Punxsutawney Phil, the groundhog famed for predicting spring’s arrival, after he got it wrong this year. Pope calls kiosk to stop newspapers: Newly-elected Pope Francis stuns the owners of a Buenos Aires newspaper kiosk, by phoning directly to cancel his order. Rare Beatles photos fetch £30,000: Pictures of The Beatles’ historic 1965 Shea Stadium concert, taken by an amateur photographer who bluffed his way backstage, sell for £30,000. Ford sorry for Berlusconi advert: The Indian unit of Ford apologises for an advert showing former Italian PM Silvio Berlusconi with a group of bound women in the boot of a car. Lack of snow worries Sochi chiefs: Organisers of the 2014 Winter Olympic store snow for next February’s event after unseasonably warm temperatures in Sochi. Lamb’s survival story on Twitter: Meet Micro Lamb – the tiny Hebridean lamb who survived the freezing North Yorkshire weather – and got her own Twitter account. Game lets Argentina invade Falklands: An Argentine company develops map for the online game Counter Strike in which Argentine ‘police’ players fight British ‘terrorists’ on the Falklands Islands. Louvre is most visited venue of 2012: The Louvre in Paris tops the list of the most visited art museums of 2012, according to the Art Newspaper. Olympic Park opens up for tours: The London Olympic Park is reopened to visitors with 20,000 tickets sold in advance. US ‘pregnant man’ refused a divorce: An Arizona judge refuses to grant a divorce for a transgender man who gave birth to three children. Last week, Australian teenager Matt Corby uploaded a photograph showing an 11-inch Subway sandwich. 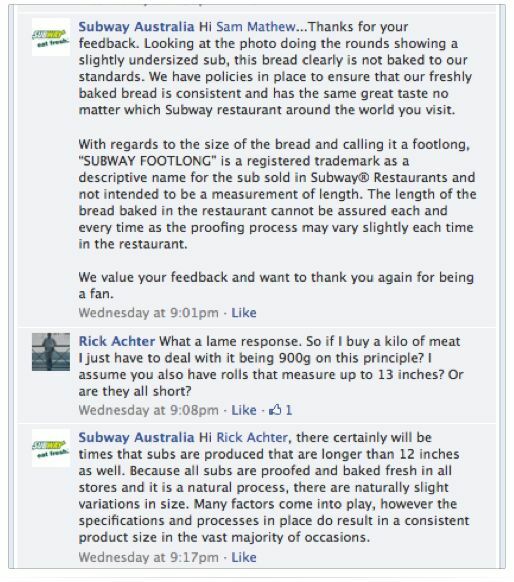 The original Facebook post has since been deleted, but Subway did respond to Corby. “Hi, Matt. Thanks for writing. Looking at this photo, this bread is not baked to our standards,” Subway wrote on Thursday in response to his post. If it were just one sandwich, the picture probably would not have gone viral, but apparently it touched a nerve with sub sandwich eaters. 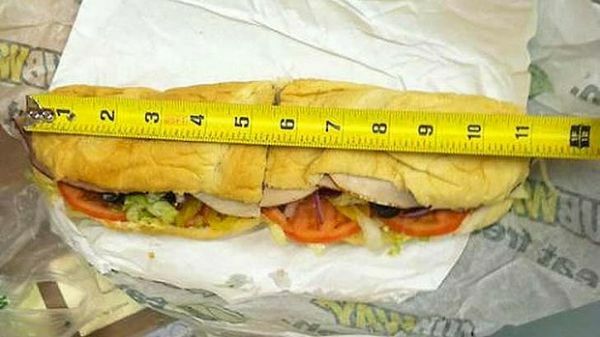 Quite a few other Facebook users posted similar pictures of a Subway footlong as 11 inches or a bit less. By the time Subway Australia responded in the comments of this Facebook post, they could no longer pretend it was an isolated incident. So if a Subway Footlong® is not intended to be a measurement of length, does the same logic apply to a 6-inch sandwich, which is made from cutting a Footlong® in half? I have not seen a picture of a 13 inch sandwich, at least not yet. A quick survey of New York City sandwiches found four out of seven at 11 or 11.5 inches. What happens if the Footlong® was actually only ten or even nine inches? What if we decided the physical money we pay for the sandwiches with was not intended to be a measurement of money? So what do you think – is this a tempest in a teapot or a place where customers should draw the line?